The Muskegon Lumberjacks have used a USHL tender to lock up a player they hope will be a team leader on the blue line. The Jacks have used a USHL tender to sign defenseman Dylan Gratton for the 2019-20 season. With a tender, Muskegon forgoes their first-round pick in the upcoming USHL Phase 1 Draft. Gratton, a Pottstown, Penn., native, turned 16 on Feb. 25. 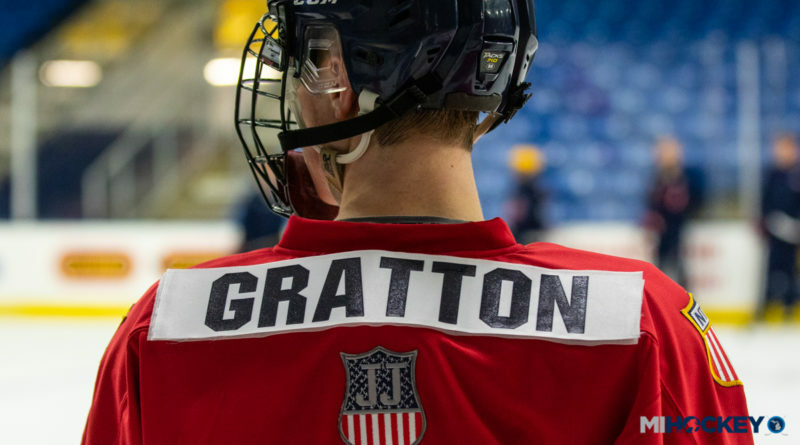 A defenseman for the North Jersey Avalanche, Gratton caught the eye of Lumberjacks coach Mike Hamilton and assistant coach Josh Nelson during the NTDP Evaluation Camp. “First of all, he is a phenomenal young man off the ice,” Hamilton said in the USHL release. “As a player, he is an effortless skater and makes a great first pass. We are very excited to have landed a player with Dylan’s abilities and character. Gratton is the sixth tender in Lumberjacks franchise history. By signing a tender, the Lumberjacks commit to playing Gratton in 55 percent of their games next year. They still have another tender, as well; a second tender would forfeit their second-round pick.